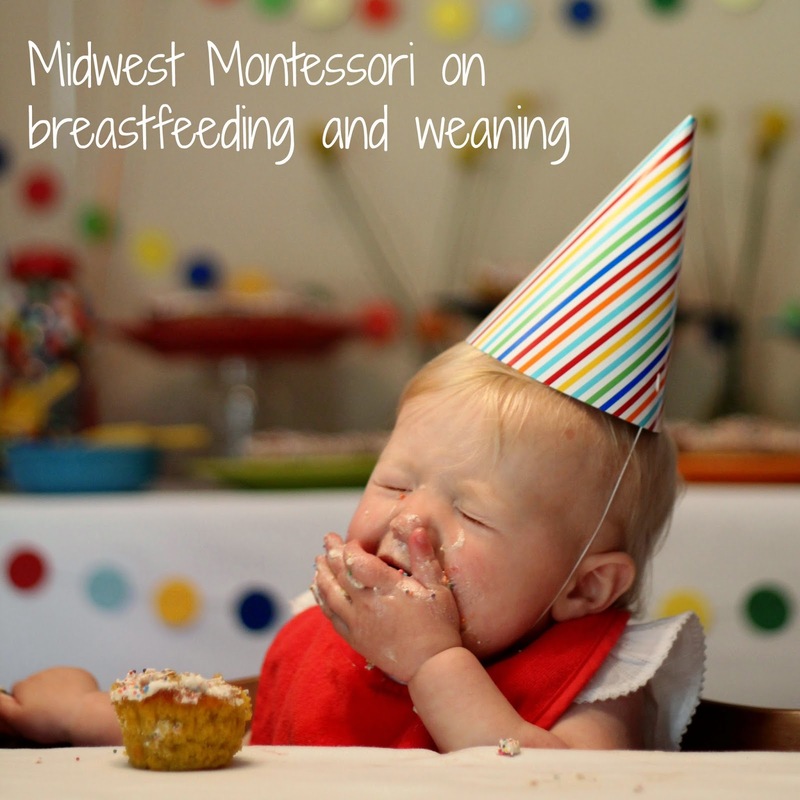 Amy of Midwest Montessori on breastfeeding and weaning! New parents are often directed to the book Montessori from the Start by Paula Polk Lillard and Lynn Lillard Jessen as a basic resource for implementing Montessori principles in the home. The book is an excellent resource for parents of children from birth to age 3. After I got pregnant, I started researching Montessori and quickly landed a copy of Montessori from the Start and got reading. I was happy to find that Montessori supports and encourages breastfeeding. I enjoyed the beautiful section on breastfeeding: the biological benefits, the emphasis on the collaborative and intimate bonding experience, common problems and some solutions, suggestions for seeking support and encouragement, and the role of the father and other children in breastfeeding. I came to a halt when I read the following statement: “After the two-month period for establishing nursing has passed, mother and child have approximately six months remaining before the process of weaning from the breast is completed.” Completed? What? Did I read something wrong? Did I miss something? No. I didn’t miss anything. These authors do suggest that weaning from the breast should begin at 6 months and completed by 9 months. Some believe that parenting styles are based on whatever is trendy or popular in a given culture at any given time. I tend to think that as society progresses based on what we learn about child development through scientific study, so does the way we parent. In my mind, the Montessori method isn't a trend, it is a science based approach to education and parenting that can and does adapt to new scientific information. The World Health Organization recommends exclusive breastfeeding up to 6 months of age, with continued breastfeeding along with appropriate complementary foods up to two years of age or beyond. I tend to believe that as a scientist (a medical doctor at that), Maria Montessori would support where science has lead us in this regard, as well as in many others. Unfortunately Paula and Lynn’s assertions on early weaning cause many parents to abandon the book, or even more unfortunate, Montessori altogether. I wish that the book could come with a caveat, and I suppose here I am writing one. So let it be known: Montessori and extended breastfeeding are not only compatible, I believe that Montessori herself, were she alive, would make the adjustment to her method personally. For those who do make the choice to breastfeed, like Paula and Lynn suggest in the book, I can’t stress enough how important it is to surround yourself with support and resources for your journey. Breastfeeding is definitely a journey that is not always easy. It is very natural but does take work and a lot of patience. A positive, stick-to-it attitude and a well-built support system is what helped me to persevere. It is important to note that it is every mother’s responsibility to create that support system, be it a mom, sisters, aunts, friends, La Leche League, a local hospital or clinic, a lactation consultant, a doctor or nurse and hopefully all of the above. There are so many people who are ready and willing to help you with your choice-take advantage of it. Here are some of my favorite resources to help keep you sane. In the early days, I referred to the Timeline of a Breastfed Baby post by The Alpha Parent at least weekly, almost daily. It provided great reassurance and helped my mind prepare for the evolution of breastfeeding, especially growth spurts. Another site I checked often is Kellymom.com. I attended a La Leche League meeting a month before Charlotte was born. I haven’t been since, but I’m sure I would if I were having many issues. It seems like a great place to discuss things and get general support from other nursing moms. I did get a LLL pamphlet from this meeting that helped me find a nursing position that worked for C and me. I recommend it. I also use the lying position. My greatest resource at the beginning was a local breastfeeding walk-in clinic whose services were provided for FREE since I gave birth at the hospital that owns the clinic. They were a HUGE help when I was frustrated, exhausted and needed expert advice. I realize not everyone has this at their fingertips, but the ladies who worked in the clinic were registered nurses who specialized in breastfeeding (lactation consultants). I would recommend researching the hospitals in your area and seeking out the breastfeeding support each one offers. The biggest personal advice I give on breastfeeding is to follow your child. Be patient with him or her. Feed her when she seems hungry. Breastfed babies generally won’t overeat. They aren’t starved. You make wonderful milk - the best for your baby. Don’t stress. Just follow their lead and relax. Take things one day at a time. Easier said than done, right? As far as equipment-type resources, I would recommend a comfortable chair, pillows, burp cloths, nursing bras, nursing pads, lanolin, nursing cover, a pump and pumping accessories, like bottles, etc. For my more specific product recommendations, check out my nursing essentials blog post. Thankfully, our breastfeeding journey has overall been quite pleasant. I’m sure I wasn’t saying that three weeks in, and probably not even three months in. Charlotte is 13 months old now and recently dropped two daytime feedings and is down to two feedings per day: once when she wakes and once before bed. I plan to continue that schedule for the next year at least or until she shows a desire to drop one or both feedings. When I hear the term “weaning” I get a little nervous that it means to stop breastfeeding. In reality, weaning is the process of gradually introducing “adult” food to eventually replace breastfeeding. It is a process, not something to be completed quickly. As with the introduction of anything new, especially to an infant, the introduction of food should be respectful, low-pressure, and enjoyable. Here are a few Montessori essentials to making this process just that. 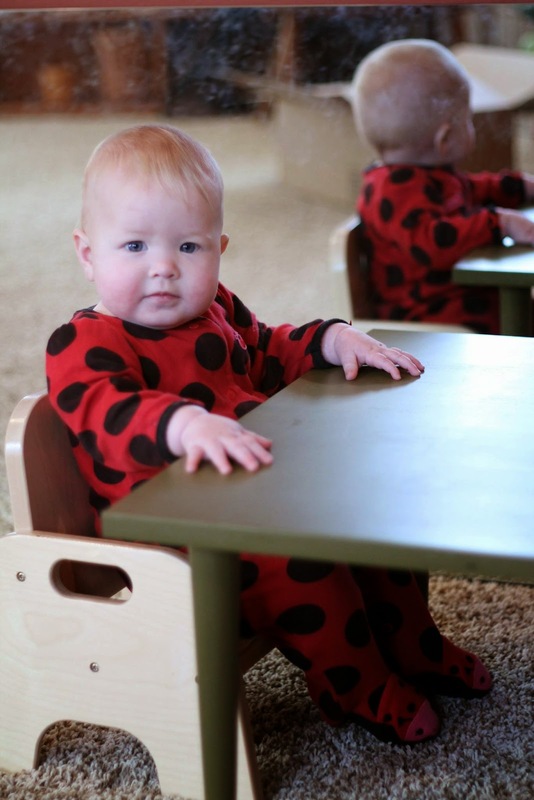 Rather than a high chair, Montessori recommends the use of a very small table and chair. Like other areas of the method, this is to encourage and facilitate independence from an early age. The experience of eating is much less daunting to a child when enjoyed at their level. The table and chair need to be appropriately sized so that the child’s feet can touch the floor. This chart is an excellent resource for choosing sizes. There are many resources for obtaining a weaning table and chair. We opted for the “Me Do It” chair from Community Playthings paired with a table we made by adding these table legs to a piece of plywood we cut down to size. A child’s first dishes, that is plates, bowls, cups, and silverware should be of natural materials and preferably breakable ones. Glass and porcelain give the child the opportunity to learn gentleness and care for their things. Plastic items that can be thrown with no visible consequence take away this teaching opportunity and provide an allowance for behavior that must be changed later. 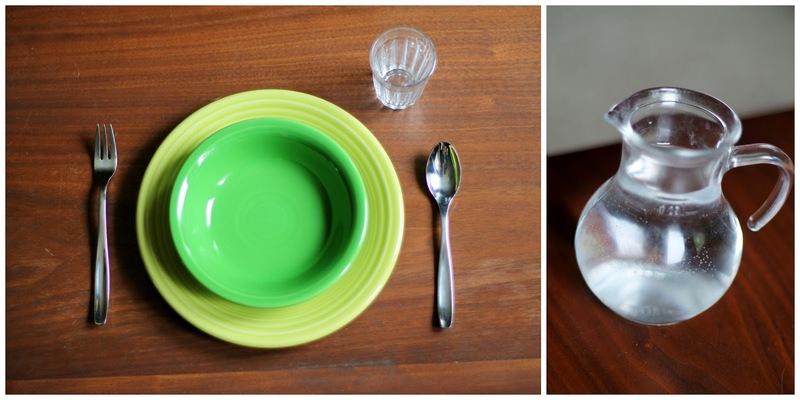 In our home, we use dessert plates and custard cups from our own adult dishes. We purchased cocktail silverware from (World Market) that is stainless steel – just like adult cutlery – from World Market. For glasses we chose shot glasses that resemble adult glasses. We also have a small pitcher that I use to refill her water so that our daughter can observe pouring for months before she is ready to learn to pour on her own. Should a family desire to have the baby at the family table for some meals, like we do, a high chair that pushes up to the table allows for the child to eventually get in and out by him or herself and sends the message to the child that they are part of the family. We opted for the Hauck Alpha chair, a less expensive version of the coveted Stokke Tripp Trapp. We later thrifted a Tripp Trapp so now we have two chairs, one for Charlotte and one for a future babe. A huge benefit to these style of chairs is that they grow with your child. They are adjustable to virtually any height, making them a valuable investment. Of course you will need bibs and sponges or dish cloths to keep things clean (and possibly some napkins if you’re into those). We also have a cup with a straw for travel (no drinks in the car, but at the park, or running errands, etc.). Our family follows the rule, “no food or drink outside of the kitchen,” while we are at home, but we do allow water when we are out and about. Kylie from How We Montessori wrote a wonderful post on the differences between baby led weaning and the Montessori approach to weaning. I find that both approaches are respectful to the child and our approach has been somewhat of a hybrid of the two. We planned on going 100% Montessori, but Charlotte wouldn’t take pureed food. We started giving her small soft finger foods and she loved it. We chose to follow her lead and allow her to feed herself. Off and on she would let us feed her with her spoon and fork, and recently she has taken to it much more. She loves to use her silverware now, even if it is just experimental. Ultimately our approach to each meal is to offer a variety of healthy foods and allow our daughter to choose when and what she wants to eat, how much, and when she is done. We trust in her ability to know her body and we trust our food choices that we provide to her. Should her weight or general health become an issue, we would address that, but so far that approach has worked well for us. We never push food and always aim for gentle and low-pressure meal times in hopes that they can remain enjoyable for her. So far Charlotte enjoys a variety of fruits, meats, some vegetables, a small amount of grains and small amounts of dairy. We try to keep her diet wholesome and minimally processed as much as we can. If she doesn’t take to a certain food right away, we offer it again later. There has yet to be a food that she doesn’t like. Now, this doesn’t mean she accepts every food we offer at every meal, but she does eat and enjoy most foods. So there you have it! Our family’s take on breastfeeding and weaning. We hope you enjoyed! Amy is a Midwest mom of 13-month-old Charlotte and wife to her husband James. Check out more from her on her blog, Midwest Montessori and on her Facebook page as well. Want more Montessori for infants? Read other infant blog posts here! Check out Lisa Nolan's affordable online Montessori for birth to 24 months here and her recommendations for Montessori infant tot books here!